Starrng: Kenneth Connor, Charles Hawtrey, Leslie Phillips, Joan Sims, Kenneth Williams, Hattie Jacques, Rosalind Knight, Ted Ray. Two daybills were printed for this film. One has Biggest Laughter Hit the other Newest Laughter Hit. Both are likely first release but impossible to say which came first. 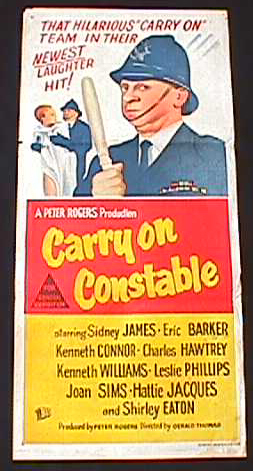 Starring: Sidney James, Kenneth Connor, Charles Hawtrey, Joan Sims, Kenneth Williams, Bill Owen, Liz Fraser. Starring: Kenneth Williams, Bernard Cribbins, Juliet Mills, Charles Hawtrey, Donald Houston, Cecil Parker.